Yikes! It has put a ‘dent’ to my supreme 100% record of collecting interest from all of my borrowers thus far. In this article, I’ll first brief you about this deal and its expected returns, the amount defaulted and my share of losses, and provide my views and thoughts about Funding Societies. Thus, here are 8 key things you need to know about my first loss investing with Funding Societies. #2: Who were my Borrowers? In brief, my borrower is a distributor of glassware and kitchen utensils with a vast retail network of 23 outlets across Malaysia. The company is owned and run by a husband and wife duo, and they have demonstrated great repayment records on their liabilities: Credit Cards, Term Loans, Personal Loans, Overdrafts, Trade Line Facilities, and Hire Purchase Loans. #3: How much did they Borrow and Why? They raised RM 400,000 with the purpose of boosting their short-term working capital in anticipation of higher sales arising from post-election of GE14 and as well as the Hari Raya celebrations. #4: How did they intend to repay? The RM 400,000 was intended to be repaid in 12 months with a simple interest rate of 14.00%. For the first two months, I received the principal and interest income as usual. In the third month, there was a late payment for my principal and interest. But, nevertheless, I collected my payment. In the fourth month onwards, the borrower failed to make their payments. This trend of missed payments followed in the fifth, sixth, and seventh month… This led to the Default Notification as shown above. In short, after lending RM 1,000, I had received a total of RM 279.30 where the principal recovered was RM 249.99 and interest income was RM 29.31. 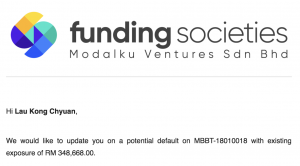 Thus, I had incurred a loss of RM 720.70 from this lending deal. #6: What Actions Funding Societies are taking to Recover this Sum? Funding Societies are in touch with the borrower. The team found out that the borrower’s anticipation of higher sales as stated above did not materialise and thus, leading to its missed repayments from the fourth month onwards. Funding Societies are exploring alternative options to recover back the outstanding amount owed to lenders. Funding Societies would submit a trade reference against the company and is in the midst of preparing for the commencement of the legal action to heighten efforts of debt collection from their end. Some of the staffs at Funding Societies had lent money to the same borrower. As such, their interests are aligned with lenders (I’m included too) and would be motivated to recover as much money as they possibly can from this borrower. On 10 August 2018, the lawyers appointed by Funding Societies have issued Letters of Demand (LOD) to the borrower where the borrower was given another 7 days to pay the Outstanding Debt Amount. If the borrower failed to pay, the lawyers would begin the legal proceedings against them. Funding Societies is organising a crowdfunding exercise to raise funds for the related legal costs and would provide an update on it. #7: What’s the Impact to My Portfolio at Funding Societies? Fortunately, it is just a ‘scratch’ to my existing portfolio. As of 27 August 2018, my annualised portfolio return is 11.14% after including the loss of my principal. 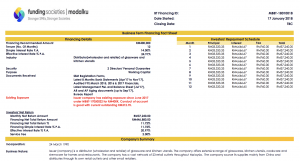 Presently, I have 53 ongoing investment deals worth a total of RM 41,764.58. From it, my expected returns are estimated to be a total of RM 6,799.58, assuming ‘no more defaults’ from my other borrowers. #8: So, What is the key to investing successfully with Funding Societies? Let’s do some maths. I have RM 41,764.58 with 53 borrowers. Thus, my risk or exposure per borrower is around RM 788, less than RM 1,000. This, I believe, is an effective measure to mitigate the impact of losses incurred from one single borrower onto my portfolio. There are two ways to go about it. First, you may customise your investments by setting the lending amount and study the profile of each borrower through the fact sheet as the screenshot above. As for myself, I use an auto investment bot where I had set my own investment criteria. The bot would filter the relevant deals and would make the investment for me, thus, is more convenient. From above, I had limited my maximum exposure to a specific deal at RM 1,000 only. As such, if a deal went wrong, the maximum loss I incur is RM 1,000, thus, effectively limited my loss from my entire portfolio. This issuer had made an additional 20% repayment after a series of collection effort by Funding Societies. And they had agreed to restructure, to pay back the balance in the next 24 months. In short, losing RM 720.70 from this deal is definitely not cool. After all, nobody likes to lose. However, I was briefed candidly about this loss and their efforts to recover this loss from Funding Societies. Thus, I had gained more confidence in Funding Societies as they had been transparent, proactive and protective of my investments made in their platform. Disclosure: The above is my referral link. Many had used it and thus, allowing me and you (both of us) to be credited an extra RM 30 which can be used for investments in Funding Societies by Funding Societies. Quiz: How much do you know about Funding Societies? 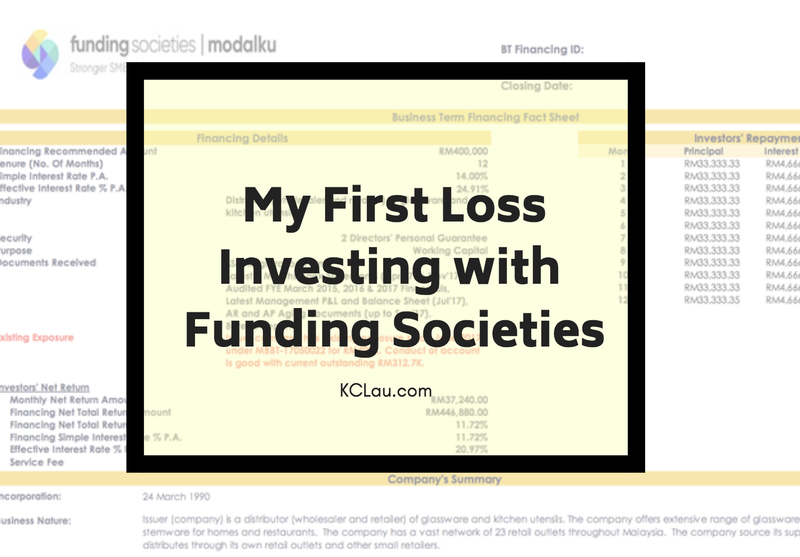 13 replies to "My First Loss Investing with Funding Societies"
Excellent insights, Master KC Lau. I have been investing in FS since July 2017. As of 2 March 2019, my annualised performance is 10.37% p.a. Presently, I have 106 ongoing investment deals worth a total of RM 13,874.68 and five defaulted notes. funding socities are recently giving loan to high risk companies and roll over loans again and again to keep its default rate low. Especially, auto-loan option became too risky nowadays. I had small investment and recently withdrew all. Got to monitor the loan quality.. and don’t opt in on those you are not comfortable with. Your updates are important to me, diversification is the key but that doesn’t mean that we can normalize the defaulters. i hope you can do more to recover the losses including stern legal actions. Defaults are inevitable in P2P lending. Diversification is key. This has a lot of tips to stay positive returns even in case of a default. Would you mind to share your Auto Investment bot setting? There are 3 type but you just only share one of it. Isn’t this a conflict of interest and insider trading? It means the people working in Funding Societies also lend money to the borrower, as one of the investors in the pool, together with us. There is nothing to do with trading, or insider trade. It is utterly irrelevant. Staffs of FS should not be allowed to invest in their own p2p as such their interest would be biased to the ones they invested in. They should be independent. Moreover they are privy to more information (insider information) than the common public which hinders “fairness” to the rest of the public investors. Unless FS has a mechanism or internal control to counter the above. What I heard from them is that they require all management personnel of FS to participate in every deal they put up. In this case, they will take the loss too when the deals go south. That is to align their interest with ours. Imagine your stock broker ask you to buy Stock A, and he didn’t put in his money, but he earns the fee when you trade – that’s the case when interest is not aligned.